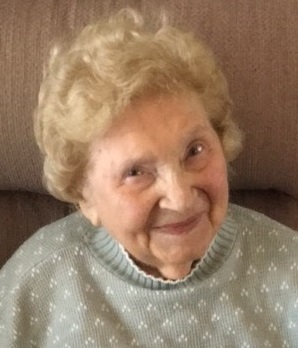 Obituary for Agnes Reid | Shore Point Funeral Home and Cremation Services, Inc.
Agnes Reid, 96, of Hazlet, New Jersey, passed away surrounded by her loving family on Monday, October 29, 2018 at Bayshore Health Care and Rehabilitation Center in Holmdel. Agnes was born on July 31, 1922 in Norway and in 1926 at just four years old, she relocated to the United States with her family aboard the passenger ship Stravengerfjord in hopes for a better life. Once living in the United States, Agnes grew up in Brooklyn, New York. During World War II, she would write letters to the "Brooklyn Boys" fighting in the war, one of them who wound up becoming her husband, Stanley. After marriage, Agnes and Stanley raised their family in the Bay Ridge section of Brooklyn, before moving to Shadow Lake Village in Middletown, New Jersey in 1997. In 2013, they retired to Hazlet, New Jersey. Before retirement, Agnes worked as a Nurse for New York University Medical Center in Manhattan, New York for many years. She was an extremely intelligent woman, a creative thinker, and a book lover. Above all else, Agnes was a beloved wife, mother, grandmother, and great grandmother, who was greatly loved by all of her family and friends and lived a long, beautiful, happy life. She was predeceased by her parents, George and Otilia (Sorenson) Anderson, her beloved husband, Stanley Reid, her loving children, Joyce Ann Reid and Thomas Charles Reid, and her 4 dear siblings. Agnes is survived by her loving children, Stanley Reid and his wife Patricia, of Glen Oaks, New York, Florence Dagsland and her husband Walter, of Mandel, Norway, Kenneth Reid of Staten Island, New York, Elizabeth Kamouh of Hazlet, New Jersey, and Alan Curtis Reid and his wife Patricia, of Middletown, New Jersey, along with her 10 cherished grandchildren and 9 adored great grandchildren. Agnes will be deeply missed, but never forgotten. Family and friends are invited to visit on Sunday, November 4, 2018 from 2:00 to 6:00 PM and Monday morning, November 5, 2018 from 8:30 to 9:15 AM at the Shore Point Funeral Home and Cremation Services, Inc., 3269 State Highway/Route 35 North, Hazlet, New Jersey 07730. A prayer service will be offered at the funeral home on Sunday evening during visitation hours. Interment will take place on Monday, November 5, 2018 at 11:30 AM at Long Island National Cemetery in Farmingdale, New York. In lieu of flowers, donations in loving memory of Agnes to the Shriners Children's Hospitals, www.shrinershospitalsforchildren.org/shc, would be greatly appreciated. For information, directions, or to send condolences to the family, please visit, www.shorepointfh.com.